Even if you’re a regular Amazon shopper, you might not be aware of the range of quality coffee you can buy on the site. 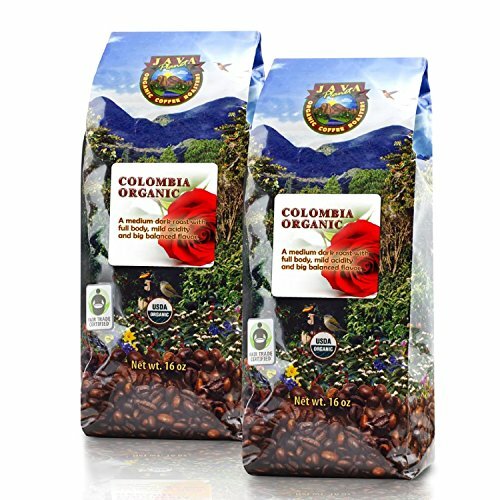 If you are looking for the best coffee from Amazon, you came to the right place! From decaf to organic, dark roast to gourmet, if you want to explore some exciting new whole bean or ground coffees, you’ll find plenty to enjoy. To get you started, we’ve picked out 9 of the best coffees on Amazon to buy, even if you are the pickiest coffee connoisseur. What Roast Should I Choose? We start things off with a genuine Amazon favorite brand. 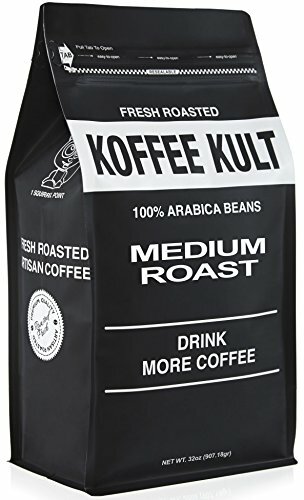 South Florida-based Koffee Kult sell a range of coffees on Amazon, but we’ve picked out their medium roast as it’s a great option that suits a range of brewing methods. With a big body and low acidity, this is a coffee to be enjoyed anytime. You’ll find this blend of Brazilian and Colombian specialty grade Arabica beans has a bold flavor and a smooth taste. This is an everyday gourmet coffee that you can enjoy via your French press, drip coffee maker, or even your espresso machine. It also makes a fine cold brew coffee. If you don’t want to grind your own beans, the medium roast is also available in a pre-ground option. Click here for latest discounts and prices! Anyone who wants, or needs, to opt for a decaffeinated coffee surely understands the difficulty in finding a decaf that tastes as good as the ‘real thing’. 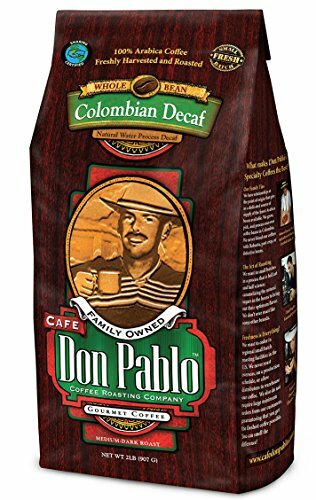 For coffee that tastes as good as any from a reputable coffee shop, thankfully, Cafe Don Pablo has stepped up to produce a fine decaffeinated option. This is a medium-dark roast that boasts hints of caramel and cocoa. The coffee is small-batch 100% Arabica Colombian that tastes smooth and robust. In case you’re unfamiliar with the Swiss water process, it’s simply a natural method of removing caffeine that retains the taste of the beans. Enjoy this coffee anytime via your drip brewer, French press, or espresso machine. If you find this a little heavy, there is also a decaf light roast option available. Check here for the latest discounts and prices! Our next choice offers a real authentic Italian coffee experience, direct from Rome. 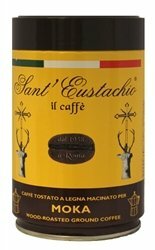 If you’re looking for something a little different, the Sant’ Eustachio range is certainly worth a try. It comes beautifully packaged in a yellow, vacuum-sealed tin. The coffee is 100% wood roasted Arabica and this particular option has been ground fine, especially for brewing with a moka pot (stovetop coffee maker). You could also try it for espresso. 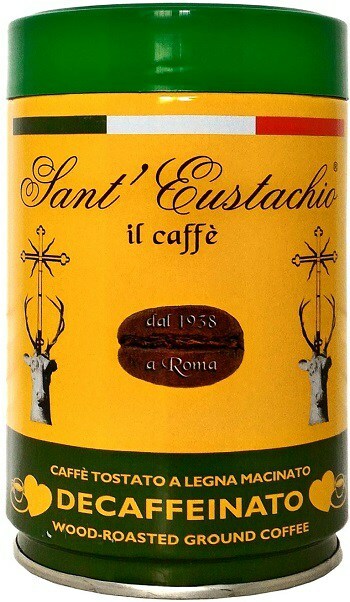 If you want a wider range of brewing options, Sant’ Eustachio also sells their coffee in whole bean form, and as drip and espresso grind. Light roast coffee can be an acquired taste, especially if you’re used to bitter coffee shop dark blends and everyday medium roast coffees. If you’re keen to try light roast coffee or want to give the gift of coffee to a loved one, Bean Box have come up with a great solution. 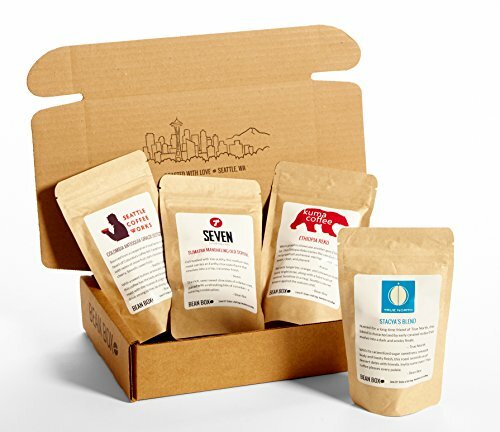 This sampler pack features 4 gourmet light roasts, courtesy of some of Seattle’s leading small-batch roasters. Not only do you get the beans, you also get brewing tips, tasting notes, and other goodies. This is a great way to explore light roast coffee and support artisan roasters at the same time. Enough of the light roasts! For our next choice, we go back to the dark side with one of Verena Street’s highly-regarded whole bean offerings. 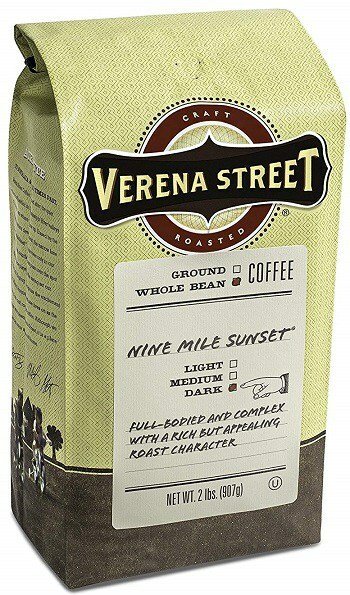 The Nine Mile Sunset French roast blend contains 100% Arabica beans. It is also Rainforest Alliance-certified, kosher-certified, and small-batch roasted for optimal flavor. 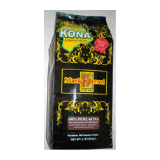 Overall, this is a rich, smooth, and aromatic specialty coffee. 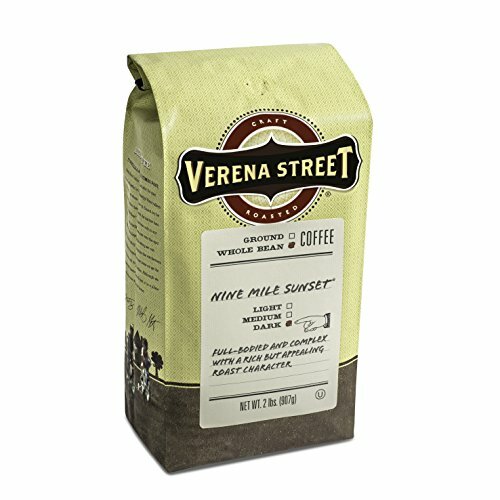 If you’re unsure about trying dark roast coffee, or find the ones you’ve tried to be too harsh or bitter, Verena Street might just change your mind. There is also a ground version that’s suitable for drip brewers. 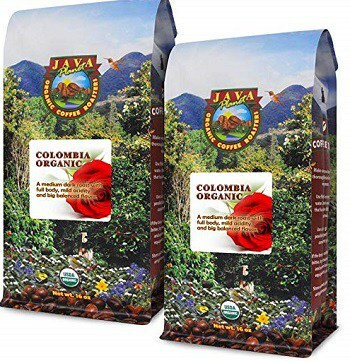 Our next choice is Java Planet’s excellent medium-dark Colombian offering. If you care about where your coffee comes from as much as you care about how it tastes, this is certainly one to try. The gourmet specialty grade-A beans are organic, Fair Trade, and shade grown. All this means you get a clean, flavorsome coffee grown without pesticides or other artificial nasties. This is a low acid coffee that comes to you fresh and full of body. Java Planet’s coffee range might be an especially worthwhile option if you suffer any gastroenterological after-effects from drinking coffee, as some reviews suggest this brew is gentler on the stomach than some other coffees. Price: Around $15 for 1lb or $28 for 2lbs. The next stop on our coffee world tour takes us to Honduras, specifically the Marcala region, which apparently boasts great coffee growing conditions. This is a single origin, light roast 100% Arabica coffee with chocolate/caramel/honey notes that has been certified as organic. The beans are small-batch roasted for flavor and to provide a low acid, robust drinking experience. This is a ‘coffee connoisseurs’ coffee that is definitely worth trying to appreciate the clean taste and complex tasting notes. 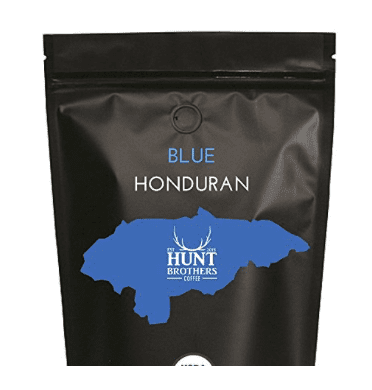 If you’re looking to take a step up from Starbucks and your regular, everyday drip coffee blend, this offering from Hunt Brothers will introduce you to a whole new world of specialty coffee. Having been around the world on our coffee journey, we return home for our next choice. 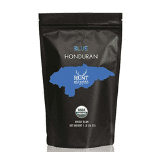 Grown on the Big Island of Hawaii’s Kona region, this single origin coffee is low yield, making it more expensive than the other coffees on the list, but certainly, one to try and savor. The coffee has notes of chocolate and nuts, and a distinct flavor. This is an easy-drinking coffee suitable for any time of the day. 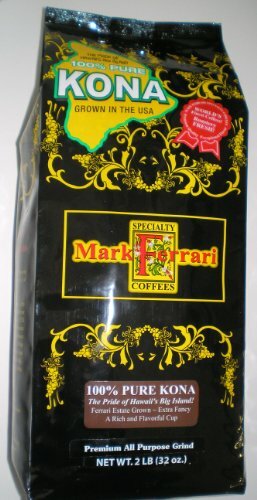 If you’ve never tried a domestic coffee before, Mark Ferrari might just convert you! Check out the latest discounts and prices! We end with something a little different. Flavored coffees can be on the gimmicky side, and for many coffee lovers simply ruin the taste of great coffee. However, if you’re partial to both a fine cup of joe and a shot of whiskey, you’ll find much to enjoy here. 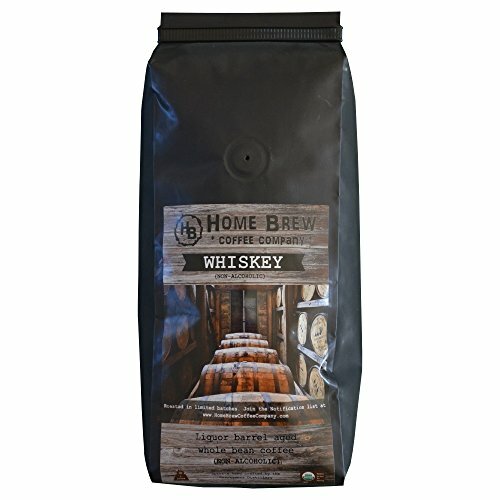 Home Brew Coffee Company have taken quality, organic-certified coffee beans from Nicaragua and aged them in whiskey barrels to produce a distinctive coffee that has a subtle whiskey flavor. This is a limited availability, small-batch coffee that, in case you were wondering, is non-alcoholic. If you like the sound of barrel-aged coffee, watch out for their beer-barrel aged, wine-barrel aged, and mead-barrel aged varieties. This roast brings out the taste of the coffee rather than the taste of the roasting process. This makes it a lighter choice that’s best-enjoyed black. If you prefer a robust brew, enjoy espresso-style coffee, or like to add lots of milk/cream/sugar to your coffee, you might find your light roast is easily overwhelmed. Tasting notes can include citrus, floral, earth, and moss. This roast means bold, dark flavors. Many people find this roast too bitter and burnt, but if you have a robust palate and want to really enjoy a coffee kick, this is the roast for you. This is the best roast for espresso and can withstand the addition of milk, cream, and sugar. Depending on the skill of roaster, dark roast coffees can be deep and intense or charred and burnt. Tasting notes include chocolate and caramel.